Summerhill's VG43 is seen operating Route 747 with its new TodayFM advert on Store Street on the 4th August 2017. VG43 is the latest addition to the summer tri-sided adverts, joining GT125 and AX523. VG43 is the second VG to get such treatment with VG49 being so covered for Lucosade in 2015. Whereas VG49 spent a lot of its time on the 747, the advert being on VG43 means that this advert will be permanently on the Airport services. 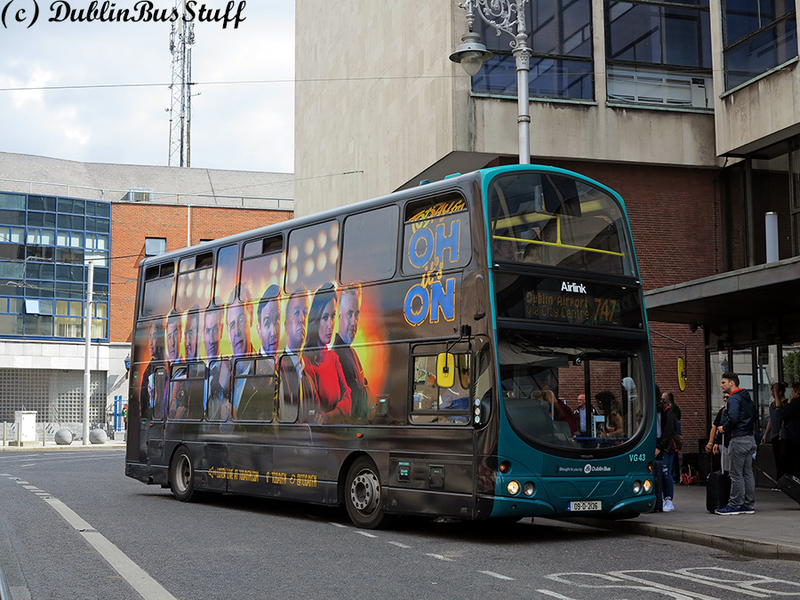 The advert is part of a major advertising campaign by TodayFM, with the slogan "Oh it's on". It joins Bus Eireann VWD41 in Cork and VWD54 in Galway in this attractive advert. The advert features all the major personalities on TodayFM radio. 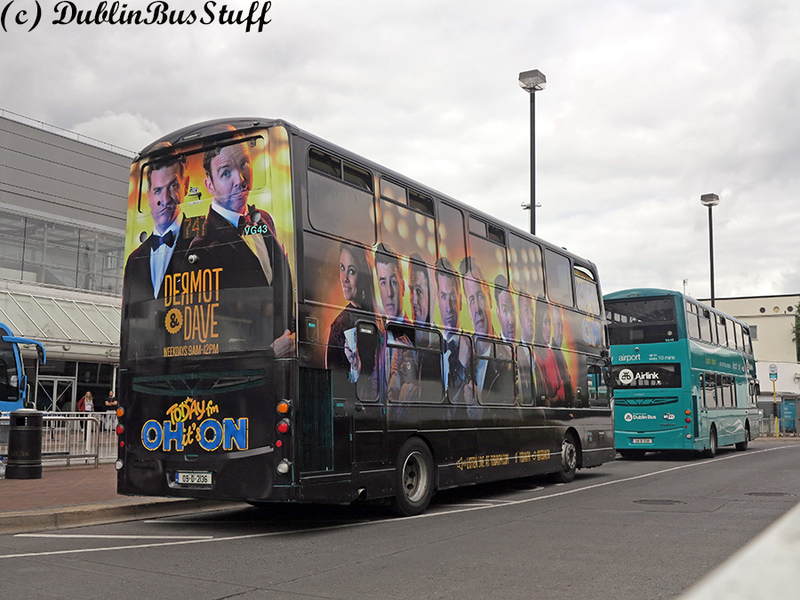 The rear of VG43 features Dermot and Dave, whereas the Bus Eireann version features Fergal Darcy. 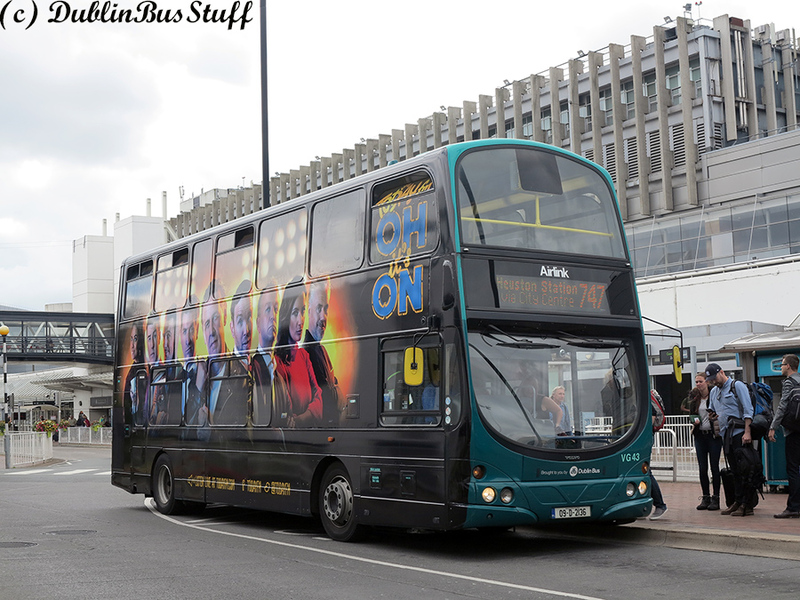 The advert is difficult to catch when the bus is moving, there being a sheen off the black vinyl. Thankfully, with VG43 marked in on the Airlink services, there are long dwell times with cash payment and luggage loading. A rear shot of VG43 at Terminal 1 on the 5th August 2017. They say buses come in threes. That is an often overused saying, however the last few weeks has brought a lot of interesting news. VG43 won in terms of coming first onto this site, but SG271, the first of the latest batch of SGs, will feature next week, while the Aston Quay diversions which started on Friday night, will have to wait a further week. Stay tuned! VG43 is seen loading for Heuston Station at Dublin Airport Terminal 1 on the 5th August 2017.